Preheat oven to 350 degrees F. Lightly grease an 8x4 inch loaf pan. In a mixing bowl, beat together canola oil, sugar, lemon juice and eggs. Combine flour, baking powder and salt; stir into egg mixture alternately with milk. 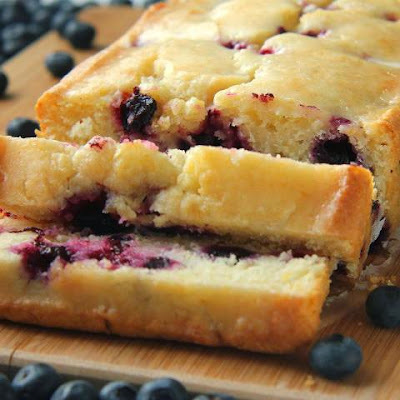 Fold in lemon zest and blueberries. Pour batter into prepared pan. Bake in preheated oven for 60 to 70 minutes, until a toothpick inserted into center of the loaf comes out clean. Cool bread in pan for 10 minutes. Meanwhile, combine 1 tablespoon lemon juice and 1/4 cup confectioners' sugar in a small bowl. Remove bread from pan and drizzle with glaze. Cool on a wire rack.